Austrian folklorist; born at Pozega, Slavonia, Oct. 7, 1859. He studied classical philology at the University of Vienna (Ph.D.), and then devoted himself to South-Slavonian folk-lore, which he was the first to investigate scientifically. He was commissioned by the Austrian crown prince Rudolph to travel through Bosnia, Herzegovina, Slavonia, Croatia, and Dalmatia, where he discovered an unsuspected wealth of Moslem and Slavic songs. For eight years he edited the folk-lore monthly "Am Urquell." 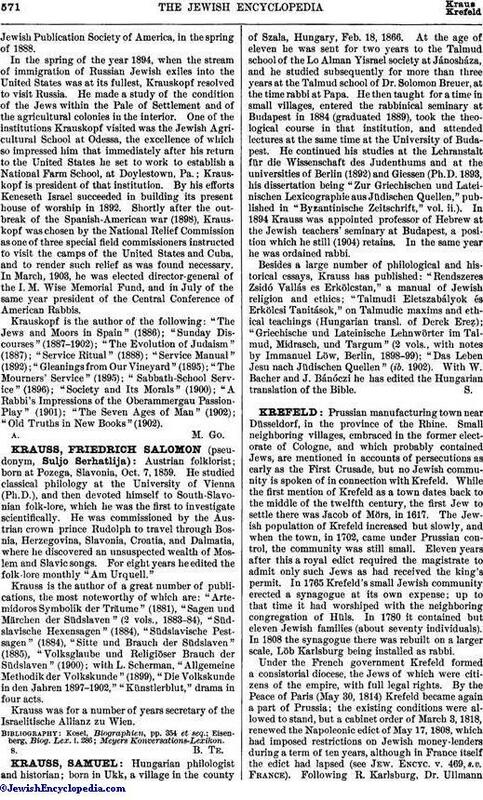 Krauss is the author of a great number of publications, the most noteworthy of which are: "Artemidoros Symbolik der Träume" (1881), "Sagen und Märchen der Südslaven" (2 vols., 1883-84), "Südslavische Hexensagen" (1884), "Südslavische Pestsagen" (1884), "Sitte und Brauch der Südslaven" (1885), "Volksglaube und Religiöser Brauch der Südslaven" (1900); with L. Scherman, "Allgemeine Methodik der Volkskunde" (1899), "Die Volkskunde in den Jahren 1897-1902," "Künstlerblut," drama in four acts. Krauss was for a number of years secretary of the Israelitische Allianz zu Wien.